Sets the industry standard for dependable and power efficient operation. 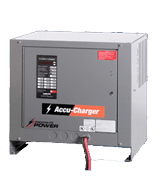 The Accu-Charger is capable of charging 100% discharged lead acid batteries in its ampere-hour rating within 8 hours. Adaptable to operate with a variety of controls, including the AC500, AC1000 and AC2000. Geared for multiple shift operations. It is designed to meet all industrial and distribution applications. It is rated to recharge normally discharged batteries in less than 8 hours. Designed for efficiency and long life. 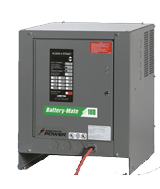 The Battery-Mate 80 can recharge 80% discharged batteries in 8 hours or less, and is engineered for one and two shift operations. 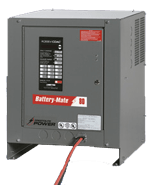 Unmatched in the industry, The Battery-Mate 80 has 3 interchangeable controls to choose from that allow greater flexibility and automation of any battery charging operation. 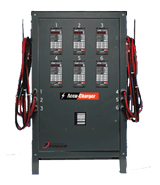 Industrial-rated ferroresonant battery charger. It is designed for industrial applications where the batteries are 80% discharged, and there is 10 hours available for recharge. Big performance at a small price. LTD chargers are designed for us in light, industrial, single-shift applications where 10 - 16 hours are available for charging. Compact, powerful and portable. 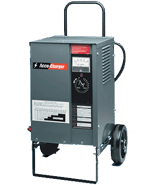 The Multi-Range Accu-Charger is designed to charge lead-acid batteries in wide range of ampere-hour capacities in 8 to 24 hours. Wall or bench mounting are standard features, or take the charger exactly where you need it with the optional portable mounting kit. 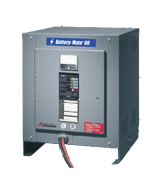 This product has been discontinued.Please see the Constant Current Battery Charger page for comparable product information. 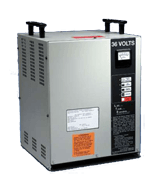 The quality leader in economical industrial battery chargers. 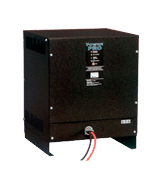 The Ferroresonant transformer provides line and load regulation for maximum battery protection.